MONTREAL, Quebec, Canada, November 30, 2012 (ENS) – A petition from an American environmental group alleging Canada’s failure to protect polar bears under Canadian law will move forward under the North American Free Trade Agreement’s environmental dispute resolution process. The Commission for Environmental Cooperation, an entity established under NAFTA, which covers Canada, the United States and Mexico, announced today that the petition provides sufficient documentation of Canada’s violations of its own laws to warrant an official response from the Canadian government within 30 days. The petition from the Center for Biological Diversity challenges the Canadian government’s 2011 decision denying polar bears “threatened” or “endangered” status under Canada’s Species at Risk Act, SARA. Instead, Canada designated the bears as a “species of special concern,” which provides no substantive protections. Canada’s listing conflicts with the 2008 United States decision to list polar bears as threatened under the U.S. Endangered Species Act because of ongoing and projected population declines from climate change – an issue of concern under NAFTA. “Climate change threatens to wipe polar bears off the map, but Canada continues to shrug off their plight,” said attorney Sarah Uhlemann on behalf of the Center for Biological Diversity. “Canada’s home to the majority of the world’s polar bears, and as such it has a duty to lead efforts to protect the species – not be the greatest obstacle to their protection. I’m hoping this finding helps push the country to recognize the serious threats facing polar bears and act to protect them,” Uhlemann said. The total number of polar bears worldwide is estimated to be 20,000 to 25,000, according to the Polar Bear Specialist Group, a division of the International Union for the Conservation of Nature’s Species Survival Commission. 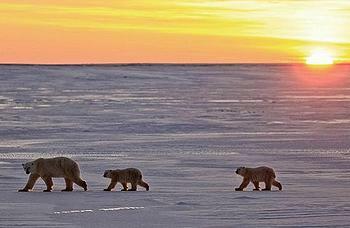 Canada’s polar bear population is estimated at between 13,000 and 17,000 of the total world population. Canada is one of five polar bear range states – the other four are Greenland, Norway, Russia and the United States. In its challenge before the Commission for Environmental Cooperation, the Center alleges that the Committee on the Status of Endangered Wildlife in Canada, COSEWIC, failed to consider the best available information about the status of the polar bear in Canada. Based on COSEWIC’s recommendation, Canada listed the polar bear as a species of special concern rather than a threatened or endangered species, a listing that allowed the government to avoid extending substantive protections to the species. Among other alleged failures to effectively enforce SARA, the Center asserts that Canada failed to meet deadlines in making its listing decision. In its challenge, the Center alleges that the proper listing would have afforded greater protection to polar bears and their critical habitat. The Center says scientists predict that more than two-thirds of the world’s polar bears will disappear by 2050 because of climate change, which is melting the sea ice they depend on to survive. Some populations, like the Western Hudson Bay population near Churchill, have already suffered serious declines, the Center warns. Yet, complains the Center, Canada refuses to recognize the threat global warming poses to the species, specifically ignoring climate impacts on the species when making the “special concern” decision last year. “Conservation plans for polar bears must consider highly variable transient effects as well as predictable ultimate effects of the global warming challenge,” the scientists said. Canada has 30 days to provide its response to the Center’s challenge and in exceptional circumstances, up to 60 days, the Commission said. Then the Secretariat will review the submission in light of any response to determine whether it warrants progression to the next level, known as development of a factual record. In a separate action, in January 2012 the Center filed a formal request with the U.S. government seeking trade sanctions against Canada for approving unsustainable hunting quotas for Hudson Bay polar bears over the objections of polar bear scientists and in violation of the 1973 Agreement for the Conservation of Polar Bears, a treaty signed by both Canada and the United States. More than 600 polar bears are killed in Canada each year, including through sport hunting, and about half of those bears are later exported as skins and rugs, primarily to Asia. While the United States has yet to act on the Center’s sanctions request, the American government has, with Russian support, proposed a ban on the international trade in polar bear parts under the Convention on International Trade in Endangered Species, CITES. A decision on the trade ban will be made at a March 2013 CITES meeting.